Since a child, spending time outdoors has been one of my favorite pastimes. 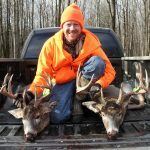 I have gained much experience in hunting and hiking over the years. As a seasoned outdoorsman, there are dozens of pairs of boots that I’ve gone through to keep my feet pain-free and comfortable for the duration of the trips. 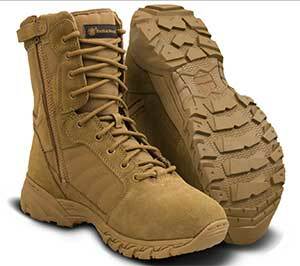 I’ve also discovered that many of the boots worn by me are also popular for military servicemen and women, especially during their ranger school training. Boot durability and sizing are principal aspects to pay attention to here, and brands that are high in quality will help keep the feet well protected. 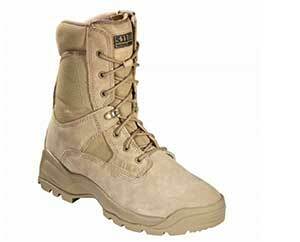 Below are ten boots that perform great in rough environments and manage to be comfortable at the same time. 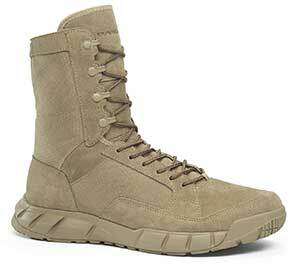 The Garmont T8 NFS Tactical is a dark beige colored boot that specializes in keeping the pain away from the wearer. 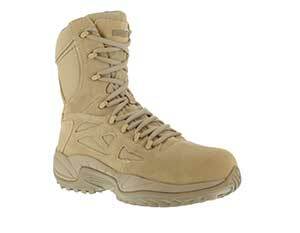 In the toughest of terrain, the pair will maintain its comfort level for the entire duration of your training. Blisters won’t form, and break in is completed no less than six hours. If you need boots that won’t break tear, brittle, or show signs of damaged early in their life, put this brand at the top of your “to buy” list. As an Editor’s Choice (me), you’re getting the best of everything with the Garmont T8. As an Editor’s Choice (me), you’re getting the best of everything with the Garmont T8. The Belleville TR550 Khyber 2 is another dark beige pair with a terrific break in. In fact, the shape will conform so well to the feet that wearers who go down a pair (in size) will feel little to no difference from wearing a pair that matches their ordinary size more closely. That means you have more room to perfect the right size. 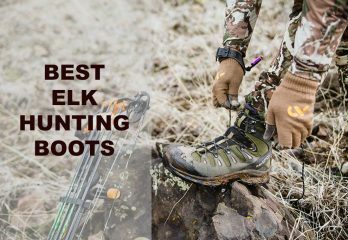 You’ll find yourself gripping to wet and smooth rocks much easier than other boots, along with greater freedom to don your favorite socks, even if they’re a little thick. 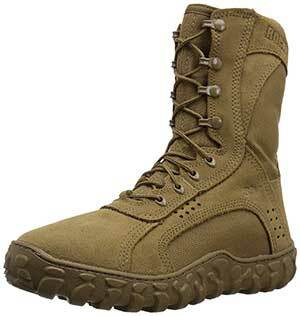 As the Editor’s Choice, the TR550 is a great all-around boot for both ranger school or normal outdoor wear. The Danner Tachyon has four different colors to choose from, but that’s not the only attribute that should be mentioned. Less weight is key here, and the boots are great for people who tend to shy away from heavier brands. You also shouldn’t worry too much about oversizing, as the chart is accurate and should align to most foot lengths. While it may be a little weaker than heavier boots, most wearers shouldn’t encounter few issues. The Bates GX-8 are zippered boots that will greatly assist those who like to put on their footwear quickly and without a heavy reliance on the laces. That isn’t a criticism of the laces on the shoes though; they’re also well-built and extremely durable. Your feet shouldn’t sweat with these, and the material gives the entire boot an appearance of being heavy but is, in fact, lightweight. Although the toe box could be a bit larger, the chances of irritation could be lowered by going a size higher. The Smith and Wesson Breach 2.0 is another zippered boot with Coyote and Black varieties, with the black being polish-friendly. If you’re big on getting the shortest possible break in for your boots, then this is the pair for you. The time it’ll take them to become accustomed to your feet is nearly nonexistent. Wear them for about an hour or two, and you’ll be set. Just be careful if you’re going for something with strong water protection. They will perform well in general rainfall, but liquid could absorb into the tongue and cause your upper feet to become damp. The Break 2.0 is best is dry to temperate environments that don’t receive higher than average precipitation. 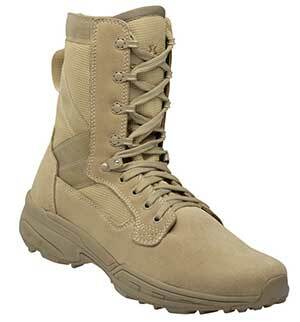 Consisting of a material that visually resembles a canvas, the 5.11 are strong boots with a short break in, good insoles, and stitched with great care along the tread and shaft. This makes it an ideal product for places with dry and warm climates. Taking them out in winter weather might not appeal to you, however. The shoe material is a little on the thin side, and may cause your feet to feel somewhat cold.Thicker socks could help prevent this but will result in a tighter overall fit. The 5.11 is suggested for anyone that’s doesn’t concern themselves with temperature ratings. 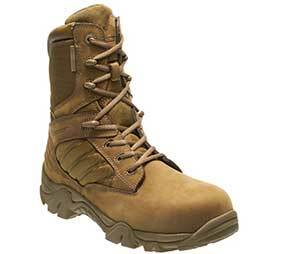 The Rocky RKC050 is a military-ready boot that has lots going for it in the interior. The fit is almost like sneakers, whereby they are soft and flexible on the inside but tough and sturdy on the outside. Weight is sacrificed for comfort, though. If you’re not accustomed to heavy boots, you may want to look elsewhere. They are pretty bulky, which could result in aching feet after worn for long hours. But if you’re a seasoned boot wearer, give them a try. The Oakley Light Assault Boots 2 feels extremely light and well-balanced, having an even weight distribution that doesn’t become heavy in the front. You can move in them quickly, and the comfort is to the point where you may wish to wear them casually during your everyday routine. They don’t cause pain and let in air when walking, so it’s unlikely that you’ll encounter sweating. The Bates Ultra-Lites are made from nylon, which makes them a breeze to keep clean. You could take them out during muddy water and a simple brush down should bring them back to a like-new condition. Don’t worry about anything getting into your soles, so long as you’re not planning on wading through water that’s higher than ankle-deep. Lastly, the Reebok Work Duty Rapid Response is light beige pair with outstanding soles and great paddling along the shaft and upper interior. The sneaker-like fit is great for people that have experienced pain along the ankles after long walks or runs. Break in is also highly time-consuming. Regardless, the Rapid Response could work if you’re not concerned with appearance. No matter what type of terrain you’re in during ranger school training, it goes without saying that footwear will play a detrimental part in determining how you finish the courses and handle the obstacles that much be completed during any particular mission. That’s why you should get to know the technical details concerning each of the boots shown in the reviews. Some of them are better equipped to handle certain situations better than others, but the majority of them manage to hit the high mark with just about every stat. Use the information below to shorten down the choices you’re considering for purchase. Like everything, paying attention to the small things can help you out in big situations. This also applies to find the boots you want to use in the field. 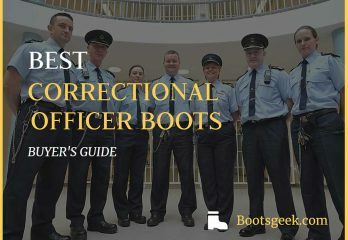 You may already be familiar with boots of this type, or have a general understanding of what fits your feet best. But don’t forget about smaller features as well, such as laces quality, toe box room, or even if there’s a sling in the back of the boot to help you put them on quicker. Or what about zippers? Maybe you’ll be better off with them since they’re less depending on laces. Material quality near the tread should also concern you, as that tends to be the location where boots often break first from prolonged wear. Just looking at the thickness and stitching of boots could be enough to save you from ending up with something that would break during active wear. Boots are the same as any other shoe; you’ll want to be certain that the size you purchase fits your feet well. Failure to do this would not only wear down the boots much faster but cause potential injuries. But not all boots are easy to acquire in an accurate size. Sizing charts are usually different from every boot you’ll see. And to make matters even more complicated, the width could also inaccurate. Whenever you come across a pair that you believe doesn’t line up with what the manufacturer specifies (in regards to its length/width), look at the dimensions. If that doesn’t help, don’t hesitate to contact the manufacturer and give them your foot measurements, if needed. The perfect size could be either a higher or lower margin than what you’re accustomed to putting on your feet. It’s likely that you’ll be training in wet or humid environments. Fewer things can wear down shoes quicker than water and heat mixed together. 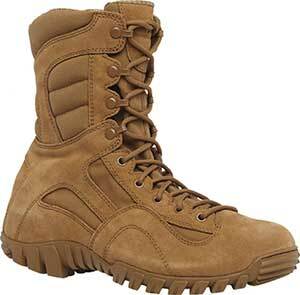 To keep your feet in proper shape during ranger school, pay attention to the insoles and breathability of the boot. Additionally, you could be better off with something that has a thicker lining around the sides and shaft, which is a good way to protect your feet from sweating. But keep in mind that the thicker the boot, the more likely you are to have added weight and/or a higher temperature rating. 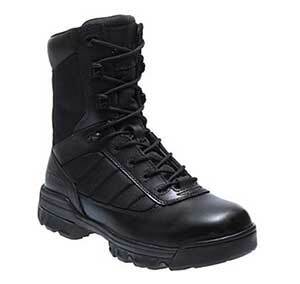 Thinner boots are typically easier to maneuver and sprint in but tear up a lot faster. However, there are exceptions and higher mass doesn’t always equate to a weaker boot. Much of this comes down to personal preference, but always look into what defenses the boot has to combat water. 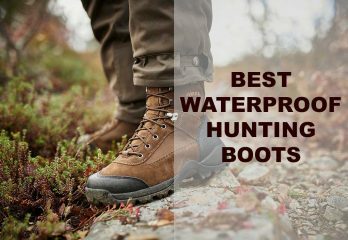 Even if the boot is water resistant, the likelihood of getting your feet wet from the inside is slim to none. You should think of the tread as the tires for your body. It is the part that comes into contact with the ground, thereby should be examined carefully before settling on one product. One aspect that’s often looked over with treads is the gaps in between the “teeth.” These areas, once dirty or clogged, will be less likely to prevent you from slipping over wet rocks or weakened from sticking to jagged surfaces without sliding. They could also become very irritable if rocks or pebbles get into the spaces, and keep you from focusing on your mission. When you’re checking out any pair of boots, inspect the tread pattern and thickness, being especially vigilant of how well it appears to be fastened to the center material from the exterior. While a simple visual examination isn’t always useful, looking at what other reviewers have said (or photographed) of the boots should suffice. When will they be comfortable to wear? Just about every piece of footwear has a break in period that can last from either a few hours to several weeks. But having a long break in doesn’t always equate to a poor quality shoe, so don’t make your purchasing choice completely dependent on this alone. If you are going for a boot that you know will probably take some time to take the shape of your feet, try to buy them at least a week ahead of the time that they’ll be worn. That way, you’ll be less likely to encounter irritation such as tightness around the center or poor circulation near the ankles and toes. These are all issues that, if not reduced, could lead to pain and/or swelling. Make your choice as early as possible, then walk in the boots for at least 30 minutes a day for a few days prior to your training. 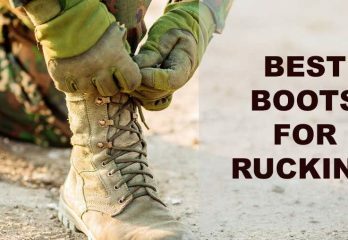 While many of the ways to prevent foot problems were discussed in the previous section, there are some other things you could do to minimize things like corns and calluses from appearing on your feet after you’re done with ranger school. Be sure that you’re taking comfortable socks with you, preferably pairs that aren’t too tight when you put on the boots. If your feet sweat a lot, you’ll probably be better off with boots that allow in the air when you’re active, something that’s featured on many of the lightweight brands shown in the reviews above. Furthermore, remember to look at the arches. Some boots are better for those with flatter feet than normal while others have larger, more protruding arches that conform to curvy feet better. 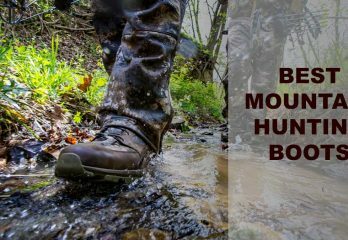 Heavy boots are great for getting through hard-to-travel surfaces that aren’t flat and have many jagged and uneven rocks. They may also hold up for longer periods of time than their lighter counterparts. But they could also lead the wearer feeling fatigued and tired, especially in individuals aren’t aren’t used to having them on for a long time. 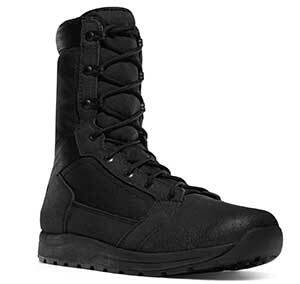 Lightweight ranger school boots are easier to run in, contain better flexibility in the materials, and have form-fitting shafts with easy-to-tie laces. But they could also rip much easier and separate from the tread quicker than the heavier varieties, so keep this in mind if you’re going to be wearing them in a location with very rough surfaces. It’s likely that you’re confident in what shoe you want to get by now. Each product offers lots for field wear, and may even see wear for normal activities that don’t require the physical demands that are synonymous with ranger school. 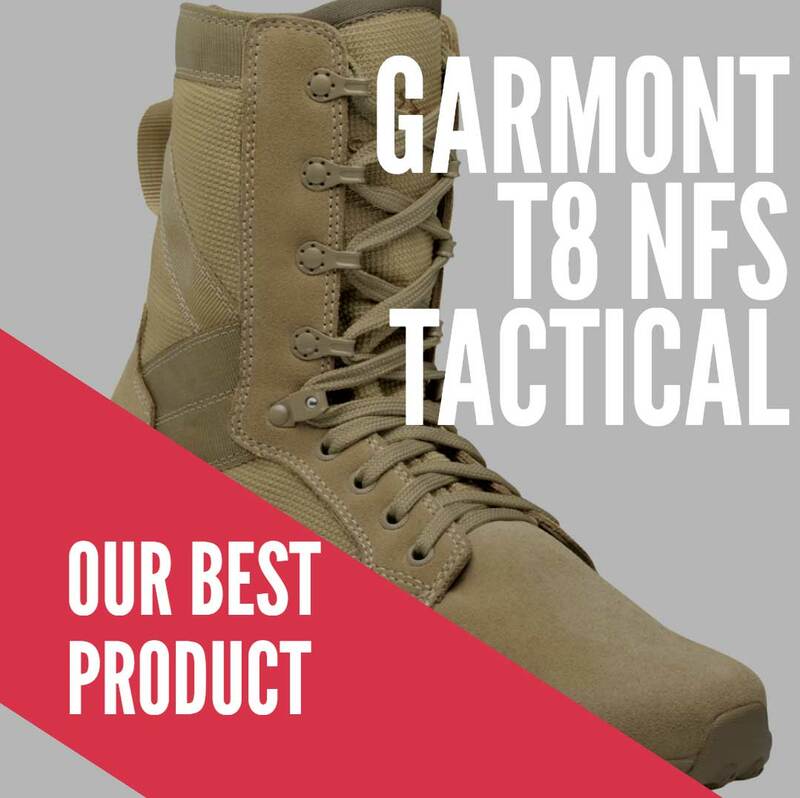 But if you haven’t decided on what you want, consider the Garmont T8 NFS Tactical and Belleville TR550, as they rank as the top two in the reviews and carry the best overall features and protection for outdoor work. But this is in no way a put down to the other great boots shown; they could offer more in terms of specific attributes. Even if you were to randomly pick a pair from the list, it’s certain that you’ll be satisfied with the quality of the boot and its fit. In short, your training will be made a little bit easier with these great pieces of footwear.